"12 Strong is a very weak movie." 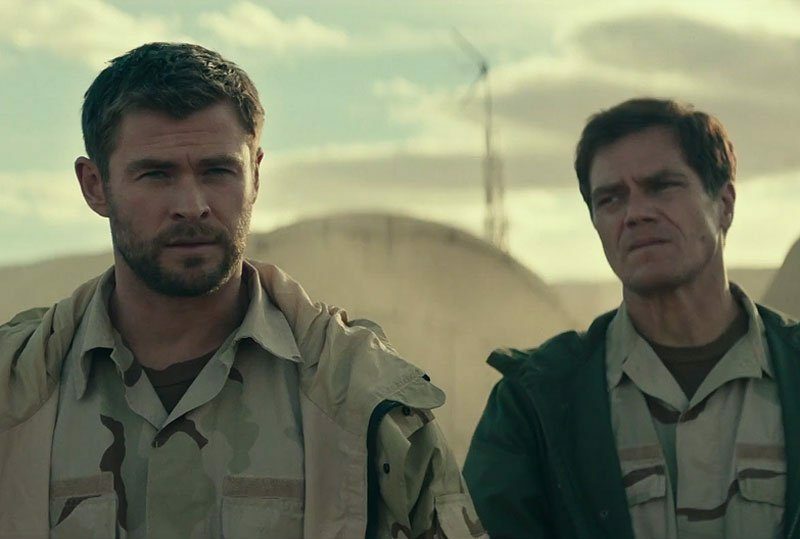 12 Strong is a new movie from director Nicolai Fulgsig, starring Chris Hemsworth, Michael Shannon, Michael Pena, chronicling the story of the first American Special Ops team sent into Afghanistan after 9/11. 12 Strong tells the story of twelve American soldiers, who are flown into Afghanistan less than two months after 9/11. Their mission was not necessarily to go to war but to align themselves with warlords in the Northern Alliance and radio coordinates of the Taliban strongholds to U.S. military who have previously been bombing them blind. Securing the area, including the key city of Mazar-I-Sharif, would help the U.S. military with a full-scale invasion of Kabul. The story focuses on twelve men, with a very unusual mission who made a very strong promise to return home to their families, despite wandering aimlessly through the Taliban with men who they don’t fully trust, and militant groups who will stop at nothing to kill them. Chris Hemsworth portrays Captain Mitch Nelson, who recently quit his Special Forces unit and immediately rejoins upon seeing the events of 9/11 taking place on his home television. Mitch wants his old team back, but he doesn’t have any war experience and has a hard time convincing his superiors that he is the best man for the job. His former superior officer refuses to reinstate him, but Chief Warrant Officer Hall Spencer (Michael Shannon) makes a case for him that secures the team’s place in aiding the Northern Alliance. After more convincing, this time with a prickly colonel (William Fichtner), the twelve men fly to meet North Alliance warlord General Dostun (the excellent Navid Negahban from Homeland). The best word that can be used to describe 12 Strong is uneventful. There are some events that happen, you understand that they are significant, but the movie is so bland you don’t really care. The movie is based on a best-selling book, “Horse Soldiers” by Doug Stanton, which chronicles the events of the Afghanistan war in great detail, a detail that is probably beautifully described with words, that does not give the writing justice in each of the brief battle scenes. "Horse Soldiers" chronicled a story of brotherhood and trust, whereas the movie took the very standard route of a ragtag team of soldiers who succeeded at this mission when no one believed that they could. A movie that we have seen a million times before. 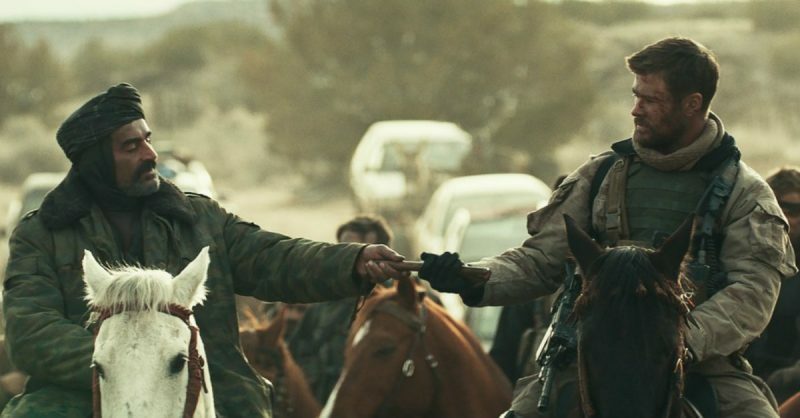 12 Strong’s other weakness is the lack of chemistry between the actors. The team, (Michael Shannon, Trevante Rhodes, Thad Luckinbill, Austin Stowell etc.) are supposed to be a special ops team who have worked on many missions together who trust each other with their lives, but on screen, they come off like they just met the day before they started shooting. There is an ongoing storyline where Ben Milo (Rhodes) is insulted that he is protected by a teenage soldier (Arshia Mandavi), and it is obvious from the minute they arrive onscreen that their interaction will be the basis of a major plot point later. Chris Hemsworth’s Captain Nelson is a fictional character inspired by Mark Nutsch, the leader of the Green Beret unit who would go on to lead the Horse Soldiers. Hemsworth is extremely charismatic in the role, but he’s a little too perfect as a captain. He’s brash, intelligent, dashing, or in other words unremarkable. It would have been more believable to see to see a different actor in the role, maybe the audience could have identified more with his struggle. The director, Nicolai Fuglsig, makes the battle scenes look more like action video game more so than actual combat scenes. Great war films such as Platoon or Saving Private Ryan, look grayer in scale and each scene carries a weighted tension garnered from the audiences constant worry about the safety of the characters. Here Fuglsig just blows things up in the background and adds in some slow motion closeup shots of the actor. Even though the selling point of 12 Strong, is how twelve American soldiers went against the Taliban, and all made it home to tell about it, the audience never really has a moment of whether any of their lives are in jeopardy. This element alone takes all the excitement out of watching it. 12 Strong is forgettable: at times it can be a boring one. It is an important story that should be told, but maybe it should have been told by a different director.